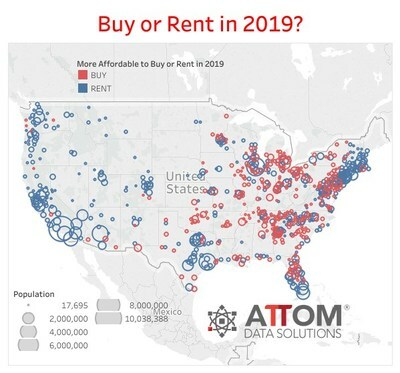 IRVINE, Calif., Jan. 10, 2019 /PRNewswire/ -- ATTOM Data Solutions, curator of the nation's premier property database, today released its 2019 Rental Affordability Report, which shows that renting a three-bedroom property is more affordable than buying a median-priced home in 442 of 755 U.S. counties analyzed for the report — 59 percent. "With rental affordability outpacing home affordability in the majority of U.S. housing markets, and home prices rising faster than rental rates, the American dream of owning a home, may be just that — a dream," said Jennifer von Pohlmann, director of content and PR at ATTOM Data Solutions. "With home price appreciation increasing annually at an average of 6.7 percent in those counties analyzed for this report and rental rates increasing an average of 3.5 percent, coupled with the fact that home prices are outpacing wages in 80 percent of the counties, renting a home is clearly becoming the more attractive option in this volatile housing market." The least affordable markets for renting are Santa Cruz County, California (81.7 percent of average wages to rent); Honolulu County, Hawaii (74.4 percent); Spotsylvania County, Virginia (73.0 percent); Maui County, Hawaii (69.5 percent); San Benito County California (68.6 percent); Monroe County, Florida (67.3 percent); Sonoma County (Santa Rosa area), California (66.0 percent); Marin County (San Francisco area), California (65.6 percent); and Kings County, New York (63.7 percent). Rental affordability is average fair market rent for a three-bedroom property as a percentage of the average monthly wage (based on average weekly wages). Home buying affordability is the monthly house payment for a median-priced home (based on a 3 percent down payment and including mortgage, property tax, homeowner's insurance and private mortgage insurance) as a percentage of the average monthly wage.